Shortly after a rocket fuel expert apparently falls into some sort of trance, he disappears. Judging from the books in the scientist's library, he was heavily into the occult, and mounting evidence suggests he was under a spell... until he suddenly reappears—dead. To help solve the mystery, Steed seeks the assistance of one Catherine Gale, Ph.D., an expert in black magic. 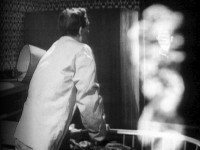 "Warlock" was originally intended to introduce Cathy Gale, but after initial production on 7 July 1962, the producers decided to re-record the bulk of the scenes between Steed and Cathy sometime during December 1962 and January 1963, according to television historian and author Andrew Pixley (but when exactly this took place is not yet known). Still, the dialog tends to create the feeling that this was Steed and Cathy's first meeting. 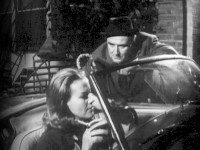 The scene with Steed and Cathy in her car outside was originally videotaped on 6 July 1962. Also, The six actors uncredited with a role played the people in the Secret Chamber, Pub, Bookshop and Lecture scenes. The best scene is actually a blooper by Peter Arne, playing Cosmo Gallion, when he drops a clipboard on the floor ("...so sorry...")! Ah, well, when the cameras are rolling, you gotta keep moving, since in those days video edits cost £150 each! Steed (who is inebriated at the time) is remarking to Cathy about discovering her breaking into the scientist's library. "Did I break any bones?" she barks.